The article "Phonomenal" has been updated with new information about the Sound Blaster, Roland LAPC-I, Covox Speech thing and Disney Sound Source. The complete change list will be shown to you on app start, you will also find it under "Help & More"
You can get it on the App Store. More information is available on iconnecthue.com. This is where one's heart is beating faster. Seeing your own efforts being recognized. 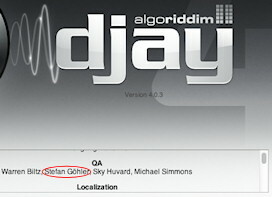 I was working for Algoriddim for QA testing djay and when preparing a preset for MidiPads and djay I remembered that I was added to the QA team list. 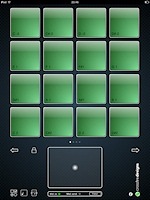 By the way, this is a really intuitive mixing app. You can get it on Algoriddim.com for iPad, iPhone and Mac OS X. Also, see MidiPads 1.5 in the news with a great review on createdigitalmusic.com. Help me by rating MidiPads on the store and sending me new suggestions to make it even better! Finally, it's been done! 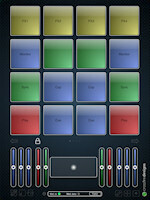 MidiPads (yes, that's right, changed the name slightly) has been released on the App Store. After the many positive responses and good ideas from you, I'm proud to present the full version. Install it, try it, rate it! I you like it, if you hate it - write me! Your good ideas will form a full version which will be released in January. The next beta release of SoundLib3 is available. Waiting is over, the new release has many improvements to offer. Because it's easy to remember: you can get SoundLib also on soundlib.net. You surely were waiting for a faster release of SoundLib's second beta. Well, while all features and manual are ready, I have some problems with MSVC++ 2005. It just won't start, even after several (time consuming!) re-installs. I'll try to continue development on my secondary system, still it won't be as easy because of missing configurations and dependencies. My search for a job also consumes some of my spare time. Anyway, I wish everyone a successful 2008, and I even have a small suprise upon my sleeves: SoundLib will be hosted on soundlib.net with the next release. SoundLib is alive! After many internal improvements, extensive tests under several configurations and working on the help file, version 3 is ready to see the light of day! Beta means in this case that some parts of the interface may change and that some issues are known, but those don't affect function or stability. See release notes for details. The c't magazine published one of my articles. The article "Am Anfang stand die Raubkopie" is in the issue of 1/07 on page 84. It reports about the demo scene -- people who not only inspired not only mine but also many others work. While earlier being a race about challenging the hardware, today the presentation is what it's all about. The scene evolved from cracker groups in the early 80's and later splitted apart from illegal activities. Many companies were founded by scene members -- Futuremark (3DMark), Remedy ("Max Payne") and Starbreeze Studios ("The Chronicles of Riddick"), just to name a few. The research and writing down took me three months, the publishing took even longer. So, buy the c't and enjoy reading the article -- feedback welcome! ... and a happy new year to all visitors! Two of my customers recently got a re-design of their pages, including larger technical updates. Another page is currently under construction (using a new content management). As soon as this content management is working, updates for this page will follow. All the ones interested in what I'm doing with my camera may have a look at the new menu point "Gallery". You are actually able to leave your comments right under the image. Have fun! It's a sin not updating the page a whole year. There are actually things that have changed here, but not to the usual viewer's eye. More to happen next year -- a new content management is in work, which means less work for more content. A new, big article will follow and there are even other plans. Merry Xmas and a happy new year to everybody! Somehow there happened a few things on this page, but it seems I wasn't able to document this. You can find a good bunch of new MOD's in coding/MODs. Have fun listening! The turn-away from the world of DOS is upon the time, and hence SoundLib 2 does also support Delphi and Free Pascal for Windows. It was quite a piece of work, and it also will be for the future. The current release is an alpha-version, and should make taste for more, or simply help to find into its system. Release notes as well as SL2 itself are available under "coding". On one hand, the article "Phonomenal", for which I still receive positive response, got an update. There are additional pictures while the current pictures have been replaced by some with a much higher quality. As reference for MIDI playback, Descent I has been chosen, which is far more qualified for this task. The IBM MFC got another sample. Some content-related inconsistencies have been removed. On the other hand, you'll find another picture under "art", which is a continuity of my current photo series. One could think, the owner of this page just lies around and lets the sun improve his tan these term holidays. Well, (almost) right! But as this kind of unproductivity just keeps getting more and more annyoing, something is going on here! You'll find 3 (!) new pictures on the art page, shot with my new digi-cam. Actually, I have even more of them, but before presenting everything, I have to improve some page internals in order to show them. The article has been extended by some information, samples, images and links again. This should be the last one for the next time... have fun! Right now the english version of the article on PC sound development has been uploaded. No doubt, it was about time for an update. Not without pride I can announce my next article - about the evolution of PC Sound. In some way I have to disappoint our english readers for this moment. The article is currently only available in the German language. However, the English translation will follow in a few days! No. If I don't run out of time, it's very likely that one or two other articles will follow pretty soon. Not again another year waiting for the next one ;). Finally! I've finally done the switch to a new provider for Crossfire Designs! No just 10 K per second, the database doesn't wait for finishing its coffee-break, and anyhow and anyway. Despite the fact that my new Webhoster is kinda bit overeager, and does everything NOW (what actually caused a bit disappointment in one case, which wasn't finished), I can't complain yet. I don't wanna do any advertisement here, so ask me via mail, if interest. And before I go crazy in my raptures, I just wanna warn you, 'cause soon there will be something done on this page. Probably not referring my units, but some other parts of this page. Until then my best wishes!